"Nothing is but what is not"
The aftermath of a bloody and crude war: a lone woman curses and chants to herself, two soldiers return, the King promotes the loyal and a Lady receives a letter. Shakespeare's most bloody and hypnotic play closes out Montague Basement's 2016 season with an unfiltered journey into the troubled Thane's imagination. This a Macbeth of deeds without names, horrible imaginings and walking shadows. A violent journey towards that most hideous and unknown of destinations: the hereafter. With Travis Ash, Robert Boddington, Hannah Cox, Alex Francis, Barret Griffin, Lulu Howes, and Jem Rowe. 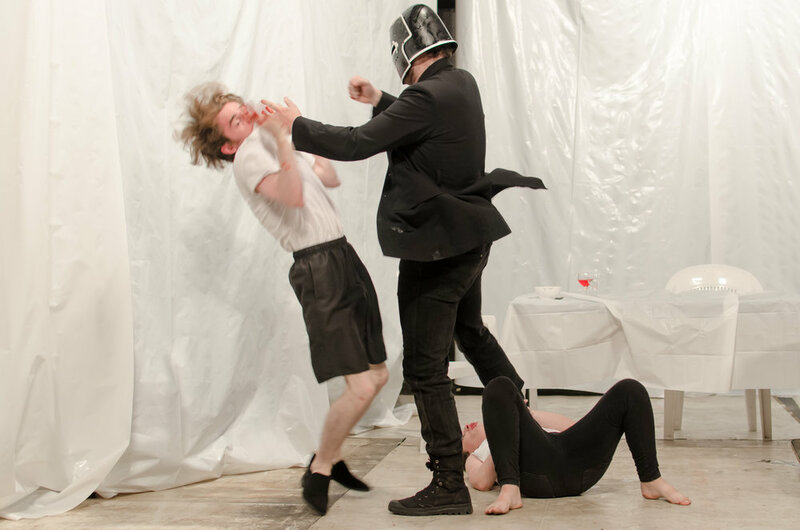 "...an unforgiving take on one of Shakespeare’s most bloody plays." "Lusty-Cavallari has turned the traditional framework of this classic play on its side, offering up a raw and visually stunning performance that might finally cure your fear of ye olde theatre." "This young, new and quirky take on an old classic is artistic and aesthetically done."